Mary Snyder made it a point to become as well educated as possible about club foot, a birth defect that causes feet to turn inward into a U-shape. The condition was detected via ultrasound when she was just 19 weeks pregnant with her daughter, Alice, now 6. Until about 10 years ago, almost all babies born with club foot had the defect corrected with surgery. Although the condition is painless in the beginning, left untreated, the child will have difficulties learning to walk and may never be able to wear normal shoes. Mobility is limited according to the degree of distortion and can lead to disability for life. Sometimes full correction requires repeated surgeries, the side effects of which include a painful build-up of scar tissue, stiffness, and arthritis. Surgery is expensive, too. Snyder wanted a less traumatic fix for her daughter. She turned to the internet. Online, Snyder found an entire community of parents of children with a club foot who felt exactly as she did. She discovered praise for a therapy known as the Ponseti Method. This noninvasive therapy takes longer but doesn’t require surgery and very little, if any, pain is experienced by the child. The Ponseti Method begins with a series of full-leg casts which turn the inward-facing foot outward by degrees with each change of the cast. After a few weeks, a snip is made to the Achilles tendon, a cast is fitted and in place for three weeks. Once the cast phase is complete, the child is fitted with special boots that connect to a bar. Each night at bedtime, the bar is attached to the boots to keep the feet in position during sleep. The bar, which may be needed for several years, is described as similar to the retainer so many people wear after having dental braces removed. Dr. Ignacio Ponseti developed this gentle, inexpensive corrective technique in the 1950s while working at the University of Iowa. Unfortunately, surgery was the more popular approach at the time - parents felt better about extreme measures and surgery brought more money to their orthopedists - so Ponseti’s technique didn’t become widely known outside the Iowa area. Parents like Snyder, armed with internet access and the desire to find a better way to correct their children’s feet, have brought the Ponseti Method to light. Today, it’s the preferred treatment, recommended by the American Academy of Orthopaedic Surgeons. When the Ponseti Method is used, 97 percent of the kids who get it never need more extensive surgery, just like Snyder’s daughter, Alice. Gold, Jenny. “How Parents And The Internet Transformed Clubfoot Treatment.” NPR Shots. NPR. Jan 27, 2014. Web. Jan 31, 2014. 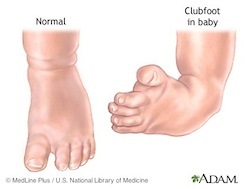 “Clubfoot Overview (.pdf).” X-Plain Patient Education. The Patient Education Institute, Inc. / The National Institutes of Health. n.d. Web. Jan 31, 2014.